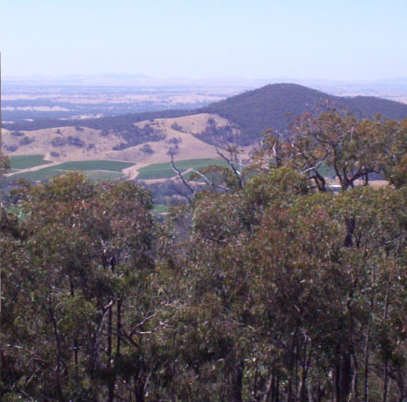 Talbot is surrounded by natural attractions including the majestic gums at the old Majorca Racecourse, the scenic landmark of Mt Beckworth, Paddys Ranges State Park, Pyrenees Ranges State Forrest and Quartz Mountain to name a few. Which ever direction you go natural attractions to explore will be found! The small town of Majorca, 12 km from Talbot, once had a public racecourse. 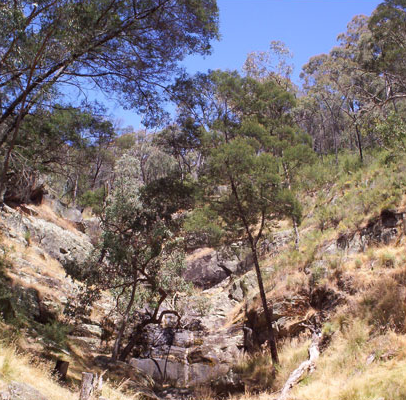 The area is now a protected area managed by Parks Victoria and McCallums Creek Landcare. It is a peaceful place for a stroll amidst native grasses and protected Red Gums, some of which are around 500 years old. When visiting, please respect the environment and watch out for falling limbs! Directions from Talbot: Head south along Scandinavian Crescent. Turn left into Oxford Street, just over the railway line and continue straight on as it become the Talbot-Majorca Road for around 4km. When you reach a T-intersection turn left into McCallums Creek Road and proceed for another approx 4 km. Turn right onto Majorca-Talbot road, and continue for 3km bringing you into the centre of Majorca. Turn right into Galloways Road and proceed for around 2km. The racecourse will be on your left. Mount Beckworth is a picturesque granite outcrop, rewarding those who climb to the summit with breathtaking views. Five pines were planted atop Mount Beckworth in 1918, but four were cut down in 1945. The sole remaining pine had its lower branches pruned and remains visible as a ‘lollypop’ landmark up to 50km away. In Spring the reserve is carpeted with more than 250 species of wildflowers, and it is a sanctuary for many native animals including kangaroos, wallabies, koalas, echidnas and over 100 species of birds. There are numerous walking tracks, including a 30 minute return path giving an overview of the surroundings (from The Dam to The Oval), and a 2.5 hour return track from The Dam to the Summit which passes old mullock heaps and great views. Several picnic and camping areas are also available. Directions from Talbot: Drive south on the Ballarat-Maryborough Road for 13 km. You will come to an intersection on the right where the railway line comes close to the road (signposted as being to the Golf Course). Turn right, and follow this road (the Old Ballarat-Maryborough Road) for around half a km, then turn into the second road on the right (Kierces Road). Note, this becomes a dirt road soon after you enter it but turns back into bitumen after the next intersection. Proceed for 4km along Kierces Road until you reach Mountain Creek Road. Turn right into and proceed for around 1.5 km when you will reach signs for the reserve. Named after an Irish miner ‘Paddy’ who reputedly roamed the area in the 1800s, Paddy’s Ranges State Park is a beautiful Box Ironbark forest dotted with relics of an industrious past that included a pastoral run, gold mining, timber harvesting, eucalyptus oil and honey production. In Spring the park bursts into life, with over 230 species of wildflowers recorded, including 30 species of orchid. The many Golden Wattle, Gold Dust Wattle and Bush Pea plants add further colour and perfume. The park is also a haven for wildlife. There are wallabies, kangaroos and echidnas, as well as nocturnal possums, antechnius and the rare brush-tailed phascagale or tuan. There are birds galore, with over 140 bird species recorded including the rare Swift Parrots who migrate from Tasmania between autumn and spring, attracted by the flowering eucalypts. Other birds in the park include Grey Shrike-thrush, rare Painted Honey-Eater, Golden and Rufous Whistlers, Peregrine Falcons and Wedge-tailed Eagles. There are BBQ, water and toilet facilities at the Settling Ponds Picnic area. Facilities are also available at the Karri Dam campground area. Walking tracks within the park are well signposted. A pleasant track suitable for prams and wheelchairs begins at the Settling Track picnic area and winds through the forest to an old eucalyptus distillery dam (40 mins return). There is also a self-guided Interprative Trail starting at the picnic area, and a forest walk to the campground. Further information about visiting Paddys Ranges can be found at the Parks Victoria website. Directions from Talbot: Head north along the Ballarat-Maryborough Road, towards Maryborough. There will be two signposted entrances to the park on your left. The first is approx 8km along, at Whipstick Track. The second is approx 11km along, at Settling Ponds Track. Rising nearly 800 metres, the Pyrenees Ranges consist of box-ironbark forests on the foothills, changing to mixed species stringybark higher up. In Spring, native wildflowers abound and the wattle trees make spectacular viewing. Over 200 species of plants and 100 species of birds have been recorded in the forest. Look out especially for wedge-tailed eagles, parrots, galahs and smaller birds like rainbow bee-eaters. There are also many other animals to watch out for including kangaroos, koalas, echidnas, goannas, and bearded dragons. There are numerous picnic and walking sites within the park. A pleasant after lunch walk (1km, 20 minutes) is signposted from the Waterfalls Picnic Area and follows the course of a creek upstream to a rock outcropping. Other picnic facilities are at Governors Rock Lookout and Cameron’s Track Campground. Directions from Talbot: Drive along the Talbot-Avoca Road for 15 km. Turn left into the Pyrenees Highway and proceed for a further 9 km. Turn right at Faraday Street (2nd right after crossing over Sunraysia Highway) and proceed to the end of the road where it bends left and becomes Vinoca Road. Proceed for around 10km through the Percydale wine district until you see signs for the Pyrenees State Forest. Quartz Mountain or the Big Reef is a massive quartz outcrop in Paddy’s Ranges between Amherst and Lillicur, about 15 minutes drive from Talbot. 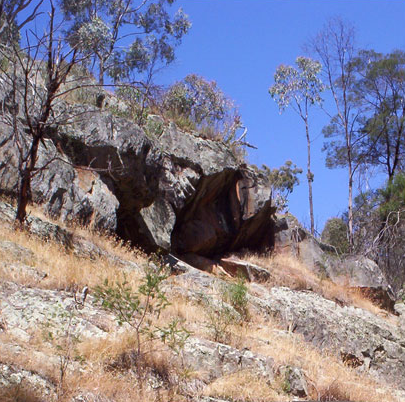 The pure quartz masses stand over six metres above the surface level of the adjoining hill. and, in one section, a magnificent 40 tonne boulder balances on top of the reef, the biggest remaining quartz reef in the Southern Hemisphere.The reef extends 800 metres north of the main outcrop. The area is rich in wildflowers with over 200 species, including about 30 species of orchids. The dominant eucalypts are Red Ironbark (Eucalyptus sderoxylon), Grey Box (Eucalyptus mircocarpa), and Yellow Gum (Eucalyptus leucoxylon). There was a little goldmining at the southern end of the main hill in the nineteenth century and a tunnel went in from the eastern side but, after going through a considerable quantity of quartz and ore, was left unfinished. Today, fossicking or prospecting in the area is prohibited. Directions from Talbot: Drive along the Talbot-Avoca Road for 2km. Turn left into McIntyres Road (before the Cemetery). Continue along this gravel road for approx 3km until you reach timbered bushland. Proceed directly ahead along Mia Mia Track for 1.5km until you reach a T-intersection. Turn left onto Tyler Track, proceed for approx 1km (passing Quartz Dam on your left). Turn right onto Quartz Track and you will see the reef and sign “Amherst Reef Geological Reserve” directly ahead on your left.